Ch. Anika's Blue Rythm N' Bounce ~ Blue tri long coat male show foundation stock (aka Buttons) who was a best in show group winning dog. 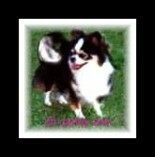 Savannah is 100 percent Anikas Chihuahuas Bloodlines, being a grand daughter of "Ch. Anika's Mystic Domino Effect-L", Savannah is a blue teacup chihuahua, weighing 3.5 pounds. Before any consideration for showing or breeding, Savannah is a cherished and adored pet and Vanna is loved! Savannah is perfect show quality, a gorgeous blue long coat chihuahua dog. We have also had our share of beautiful short hair Chihuahuas. 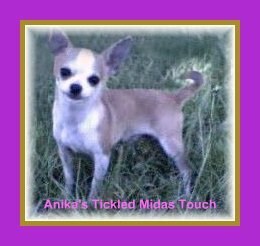 for example, Midas (above)had those beautiful dark luminous eyes I strive for in every Chihuahua dog breeding. who also has RD's Chihuahuas Bloodlines on his grand sire's pedigree..
Cookie is on the cover of Barron's Dog Bible, this is Cookie as an older pet. Cookie is 100 percent Anika-Chihuahuas bloodlines. She has a sister in Cannada, owned by Cowboy's Poms and Mr Joseph Hogenmiller Lafond & Sylvia and Savannah are her nieces. Dakota is her nephew....All are anikas blue chihuahuas. You can see the "domino-effect" in this bloodline of champion chihuahuas-anika-s through these pictures.